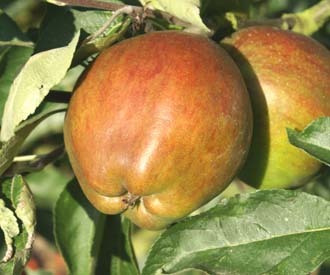 An old English apple with an unusual shape and sweet perfumed flavour orginating from Cornwall. A very old variety, brought to notice by Sir Christopher Hawkins in 1813 having been discovered in a garden in Truro, Cornwall in about 1800. The word Gilliflower is believed to have been derived from the old French word Girofle meaning clove and given to this variety because it is supposed to have a clove-like frangrance when cut. Medium to large sized, rather unusual irregular oblong or oblong-conical shaped fruit. The knobbly exterior is quite boldly ribbed and distinctly five crowned. The skin is rather rough, often with some russetting, greenish yellow with up to half flushed orange-red. Very firm yellow flesh, tinged green around the core. Rather dry but sweet with a melon like frangrance. Moderately vigorous, very spreading tree. It is a tip-bearer and unsuited for training into restricted forms such as cordons and espaliers. A light cropper.